This book describes and discusses the convergence of library and technology support in higher education. Over the past 15 years, a number of institutions have pursued merging library and technology services into a single information support organization. These mergers have taken different forms, but all seek to redefine information support in a 21st century model that promotes the interdisciplinary use of information. The coming years will see significant change affect libraries with the continuing disruption of the Internet and digitally-based services. Coupled with economic pressures, libraries and technology organizations will increasingly be forced to look closely at long-held assumptions of how their teams are organized and how work is divided and shared. 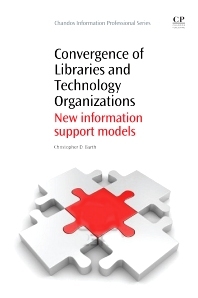 Convergence of Libraries and Technology Organizations provides useful and practical guidance on converged information organizations as an effective response to change in the information profession. Christopher D. Barth works as the Executive Director of Library and Information Services at Luther College in Decorah, Iowa, USA. He has 10 years of experience working in ‘merged’ library/technology organizations and is beginning his fourth year leading a merged library/IT team. Previously he worked as Director of Information Resources at Kenyon College in Gambier, Ohio, USA, and as Librarian at the Anchorage Daily News in Anchorage, Alaska, USA. He has previously published a history of Kenyon College titled Kenyon Reborn.